The region of Latin America and the Caribbean has long demonstrated hospitality towards those fleeing conflict and persecution within the region and from further afield. 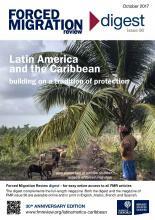 Faced with newer causes of displacement, such as the violence of organised criminal gangs and the adverse effects of climate change, Latin American and Caribbean countries are continuing to expand and adapt their protection laws and mechanisms in order to address these and other situations of displacement and to meet the differing needs of affected populations. This issue contains 31 articles on Latin America and the Caribbean, plus five ‘general’ articles on other topics. This issue of FMR will be available online and in print in English, Spanish, Arabic and French. The English versions of articles are also available in audio format. Also available is the FMR 56 digest for easy online access to all the articles published in FMR 56. It provides for each article: the title, the author(s) and their affiliation, the introductory sentences and links to the full article online. The digest will be available online and in print in all four languages. Please help disseminate this issue as widely as possible by circulating to networks, posting links, mentioning it on Twitter and Facebook and adding it to resources lists. We encourage you to circulate or reproduce any articles in their entirety but please cite: Forced Migration Review issue 56 www.fmreview.org/latinamerica-caribbean. We are grateful to the following for their financial support for this issue: CAMMINA (Central America and Mexico Migration Alliance), Entreculturas, Open Society Foundations, Platform on Disaster Displacement (PDD), Swiss Federal Department of Foreign Affairs and UNHCR.